Any way you slice it, turn time suffers under pressure of traffic. There are important lessons. First, the good news. Truck turn time in LA/LB improved spectacularly in March. It was better than we’ve seen since September 2013, scoring 49 on the METRIS Turn Time Performance Index (TTPI). Background: the TTPI has been stuck below 40 since May 2014; this is a decisive break through that ceiling. The percentage of visits over 2 hours fell to 19%, the lowest since September 2013. The bad news is that it's not evident that this will be sustained. In a previous article, I pinned performance to volume and saturation of capacity. While the ports have yet to publish last month's traffic statistics, I’m guessing that LA+LB moved 1.12–1.16 million TEUs in March — the annual post-Chinese New Year dip, well below the exceptionally healthy 1.27 million in February. That means in March, the system got a long overdue breather and had capacity to spare, hence the efficiency. There's often a modest performance spike at Chinese New Year. But none as steep as last month's. The improvement was across the board at nearly every terminal. How is METRIS turn time different? It's based on superior techniques. Every single measurement is accurate. In the 2011 METRIS Turn Time Study, I pointed out that terminals differ 2–3× in performance. Why? What are the factors and management practices that cause terminals in the same port to differ so much in productivity? Let's be careful how we consider this question. For one thing, terminal-specific performance varies wildly, as documented in an earlier article, so it's difficult to characterize terminals on a scale. Secondly, there’s both service and price differentiation. Third, terminals like everyone else are in business to profit, and operating inefficiently doesn't help them; we've now shown that they spend more on labor when turn time is poor. Recently there’s been speculation that this or that practice (wheeling, PeelOff, dray-offs, appointment systems, terminals’ business models) is what differentiates terminal productivity. Maybe so. But simple crunching of the numbers reveals that the dominant predictor of performance by terminal is simply container volume (Figure 1). Figure 1. 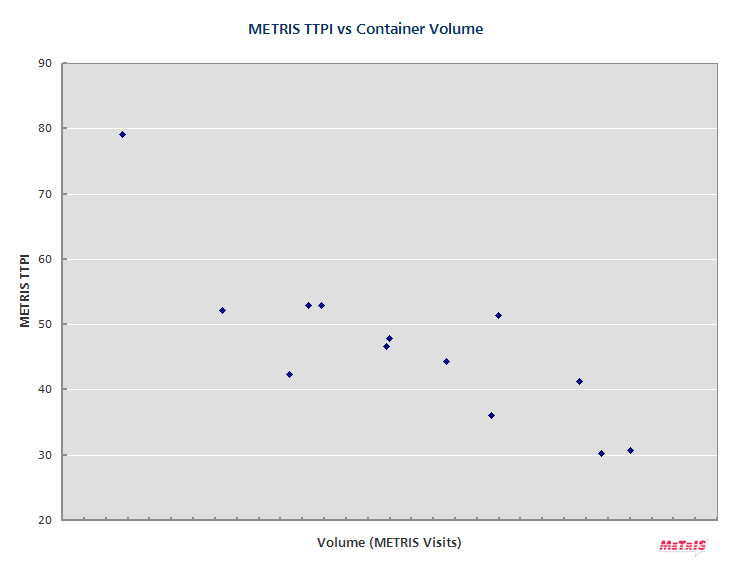 METRIS TTPI vs container volume at the thirteen LA/LB terminals. Click on the figure to see the trend curve (the point in the top left is considered an outlier, excluded from the curve). Performance and volume are averaged over 3 years. Performance and volume at each terminal vary from month to month, and this figure should not be assumed to reflect the current distribution of either. I’m going out on a limb here, treating METRIS-documented terminal visits as a surrogate measure of TEU volume, averaging over 3 years. That seems justified, because the correlation between that estimate and the TTPI is an impressive .83 on a scale of 0 to 1. This analysis reveals that a hefty 70% of the performance variation among terminals is attributable to differences in traffic volume. The more traffic the terminal handles, the longer the turn time. The numeric results do not imply cause-effect. But intuitively it makes sense: traffic may translate to calls by larger vessels; it usually means more real estate and more places a container could hide, and in general, more operational challenges. Recalling high school stats, we'd guess that Figure 1 has a straight trend-line. College stats suggests that it might not be a straight line but a curve (click on Figure 1 to display it), which says that as volume swells beyond a certain point, performance degrades more rapidly. This does not entirely invalidate terminal comparison by any means. PeelOff and other management practices account for the remaining 30% in performance variation. As terminals adopt strategies to differentiate themselves, the correlation could become less well defined and the 70-30 balance could change. The important question this analysis raises is about the wisdom of treating terminals as equals, when it comes to applying performance standards and penalties, which is gaining credence in some ports. Such policies may be unfair to bigger terminals, and could reap unintended consequences. The takeaway is that volume matters, particularly when operating at the limit of capacity. It affects turn time from one month to the next. It affects turn time from one terminal to the next. The tough choice this presents for the freight community is that as things stand, you can either be a participant in a high-volume operation (and the economies of scale that come with it) or enjoy snappy turn times. Choose your terminal and steamship line accordingly. Fortunately, on the matter of truth in turn time — absolutely accurate, synoptic and real-time measurement, coupled with insightful and straight-talking analysis — the options are far less bewildering. Ask your truckers, terminals and ports if they're using METRIS. The METRIS data archive, on which this article is based, is from METRIS GPS instruments installed in a sample of port trucks from leading drayage carriers who have been our partners over the past 9 years: Ability/Tri-Modal, California Intermodal Associates, Dependable Highway Express, Fox Transportation, G&D Transportation, Golden State Express, Harbor Division Inc, LA Grain, Port Logistics Group, Price Transfer, Progressive Transportation Services, Southern Counties Express, TK Transport, TTSI and Yamko Truck Lines.